The 2016 J.P. Morgan 34th Annual Healthcare Conference will be held January 11-14, 2016 in San Francisco, California. The annual invitation-only event gathers investors and corporate leadership from the leading large and small biotech and life science companies impacting market dynamics. The event has evolved and mutated into the largest annual convergence of biotech innovators and investors, with or without an invitation, to San Francisco. The city becomes a hub for strategic meetings and new technology licensing deals, with corporations renting out large hotel blocks, conference and reception spaces for networking opportunities and presentations. Among these ancillary opportunities is the 8th Annual Biotech Showcase 2016, taking place January 11-13 at the Parc55 Hotel, timed to coincide with the J.P. Morgan Annual Healthcare Conference. The event acts as home base for innovative mid-small cap and private life sciences companies and the public, private and strategic investors. Over 300 company presentations will take place during the three-day event. The StartUp Health Festival, held January 11-12, is a two-day experience which bringing together more than 1,000 of the world’s healthcare leaders, investors and entrepreneurs focused on reinventing healthcare. The Festival is designed to connect the next generation of healthcare entrepreneurs with hundreds of investors and visionary leaders focused on transforming healthcare. The 2016 East/West CEO Conference will be held January 9-10 at the Four Seasons Hotel San Francisco. The conference is a forum for leading executives in the life sciences, offering exclusive access to key decision makers who influence deal making and investment. Panel topics include funding innovation while balancing risk, global entrepreneurs, accessing innovation, trends in private financing, and innovative business models. A few blocks from the JP Morgan conference at the Park Central Hotel on January 11-12, presentations on the most significant 2015 biopharma deals will be held at Thomson Reuters’ Looking Back: A Review of the Biopharma Deals in 2015. The 11th Annual Non-Dilutive Funding Summit, held on January 13 at the Nikko Hotel, this year features Colonel Russell E. Coleman, Ph.D., Joint Project Manager, Medical Countermeasure Systems Assistant Corps Chief for Preventive Medicine Entomology. COL Coleman will be discussing “The Dilemma in the Development of Medical Countermeasures against Chemical and Biological Weapons: An unpredictable threat and products we hope will never be used.” Other presentations and panel discussions feature NIH representatives from NIAID, NIBIB, and NINDS. 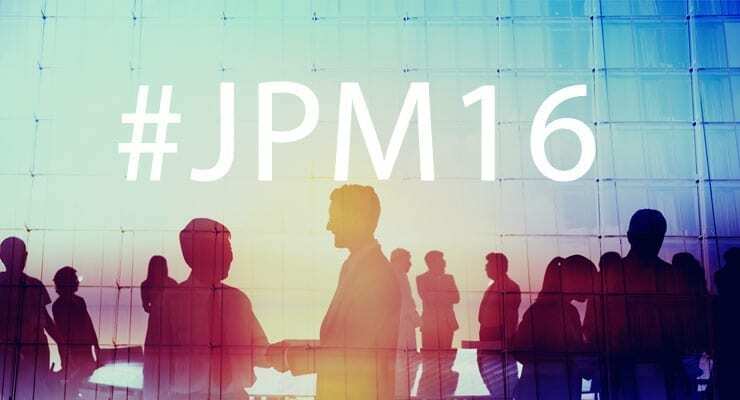 Keep up with event activities on Twitter by following #JPM16 or participate in the 6th Annual Unofficial #JPM16 Tweetup. Follow coverage by Global Biodefense on Twitter @GlobalBioD.